What next for UK Automotive? The rapid development of the digital economy is changing consumer expectations and old business models are being adapted, changed and even scrapped as a result. In the face of all this change, the primary objective of the automotive sector remains the same – to be competitive. The digitalisation of manufacturing can play a critical role in achieving this. 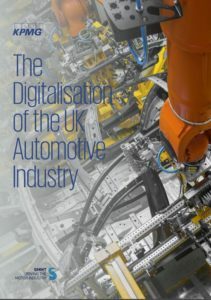 Digitalisation is already taking place in the UK automotive industry – watch our short video to learn more about the digitalisation of automotive manufacturing in the UK or read the report: The Digitalisation of the UK Automotive Industry. The UK automotive industry is one of the most productive in the UK, contributing £18.9 billion to the UK economy resulting in a gross value added per job of £111,900 – twice the national average. If the UK is to continue to thrive and stay ahead of international competitors, it must deliver high value-added, yet competitively priced, vehicles. One way of achieving greater competitiveness is through strategic investment in digital manufacturing capability. If UK Automotive continues to embrace digital manufacturing, leading to fully digital vehicle manufacturing factories (in addition to digitalisation of the supply chain) there would be £8.6 billion value added to the UK economy every year by 2035. A key contribution to this added value will be as a result of British vehicle manufacturers having improved competitiveness, as well as offering additional functionality to customers – without increasing prices. The next step in the digitalisation of automotive production will be to connect vehicle manufacturers with their supply chains – for example to monitor supply deliveries in real-time and immediately assess the impact of traffic disruption on the production schedule. From the supply chain’s perspective, having greater visibility of changes in customer demand will enable improved scheduling, reduced downtime and overtime, as well as reduced component inventory. Organisations collect a range of data from various technical disciplines – engineering, productions planning, manufacturing, procurement, finance and sales & marketing. However, often these different data sets may be sourced in many different ways and won’t communicate with each other. By having a single unified approach to data collection and analysis, manufacturers will be able to more efficiently apply scenarios, such as changes in customer demand, to the whole production process. This will result in a truly digital factory. Advanced robotics is starting to play a key role in supporting human operators in the manufacturing process. While robots could take over some of the more routine tasks, interaction between them and human workers will become more seamless, enabling production line operators to collaborate with, train and manage robots on the production line. SigmaGuardian is an Early Warning and Prevention system created by Warwick Analytics, which can find and resolve faults in a vehicle as they occur by processing raw data, which it then analyses through algorithms. Its key benefit is that it can help to reduce the time from fault detection to resolution. A recent application removed the need for the car dealer to intermediate between the vehicle owner and manufacturers; when the vehicle identified a defect, the system predicted when the fault required repair as well as the root cause of failure. As a result, the fault was repaired promptly, design engineers correspondingly changed the vehicle specification in less than half the time and the manufacturer reported 22% cost savings in its warranty remediation activities. Industrial Strategy – The benefits of digitalisation will not be realised unless the Government works in partnership with industry to support this technological transformation. The Government should, therefore, place digitalisation right at the heart of its new industrial strategy. Skills – Companies should adopt a digital strategy which includes consideration of the new skills that will be needed, what training needs to be offered to existing employees and what recruitment strategy is needed to fill the remaining skills gap. The Government should undertake a comprehensive review to access the level of critical digital expertise within the labour market and set out an ambitious strategy to address the skills gap. Digital Infrastructure – The Government’s recent commitment to invest £1 billion by 2020-2021 to support internet connectivity is welcome. In delivering on this commitment, it should prioritise in particular, connectivity in critical manufacturing hubs, including those populated by automotive manufacturers and their supply chains. Digital Standards – Sharing data between different companies is an essential part of digitalisation. This can be facilitated by developing digital standards that apply across the automotive sector and to critical adjacent industries. The Government can play an important convening role by bringing all relevant sectors to the table to help develop digital standards that apply across the sector. Cyber Security – Companies need to develop a ‘bottom-up’ methodology for assessing cyber threat use cases and then develop a cyber security strategy in response to significant threats. Financing and Investment – Digitalisation will require investment. The Government can help address this by using money from the British Business Bank to support SME’s in the automotive sector that wish to invest in digitalisation. Demonstrators – The take-up of digitalisation among SMEs requires local demonstration and access to associated technologies. The Government should work with the automotive industry to identify how many new demonstrators are needed, which technologies they should focus on and where they should be located.